Running Out Of Breakfast Ideas? 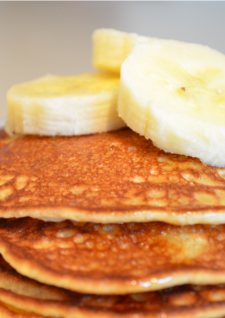 Try this quick and delicious pancake recipe. The flax meal and almond butter are a great source of heart healthy omega 3 and the BeeFit Protein Powder is packed with high quality protein and fiber and can keep you fuller longer! 1. Mash the bananas in a bowl (or blend in a food processor). Add the eggs, almond butter flax and BeeFit protein Powder. Mix until smooth. 2. Preheat a griddle or skillet. Lightly grease with coconut oil. Pour the batter in ¼ cup scoops. 3. Once you see bubbles form, flip and cook the other side until golden. Serve with fresh fruit. How Safe Are Food Preservatives?